This article is about British police boxes. For Japanese police substations sometimes called "police boxes", see Kōban. Police boxes predate the era of mobile telecommunications; nowadays members of the British police carry two-way radios and mobile phones rather than relying on fixed kiosks. :2 Most boxes are now disused or have been withdrawn from service. The blue police box is often associated with the science fiction television programme Doctor Who, in which the protagonist's time machine, a TARDIS, is in the shape of a 1960s British police box. An 1894 advertisement for the "Glasgow Style Police Signal Box System", sold by the National Telephone Company. The first public police telephones in Britain were introduced in Glasgow in 1891. These tall, hexagonal, cast-iron boxes were painted red and had large gas lanterns fixed to the roof, as well as a mechanism which enabled the central police station to light the lanterns as signals to police officers in the vicinity to call the station for instructions. As with Chicago's boxes, the original intent was that trusted members of the public would be allowed access to the telephone in case of emergency using a special key that was registered to them, which would remain trapped in the lock until released by a master key carried by a policeman. :5 A newer, rectangular type of cast-iron police box was introduced in Glasgow in 1912, but with the signal light now powered by electricity rather than gas, and access to the telephone now restricted solely to the police. Rectangular, wooden, garden shed style police boxes were introduced in Sunderland in 1923 by Chief Constable Frederick J. Crawley, and then in Newcastle in 1925 when he took over as Chief Constable there. Crawley was arguably the first proponent (at least in Britain) of the concept of the police box as a miniature police station rather than just a communications point, including unrestricted access to the telephone by the general public for contacting police, ambulance, and fire services. His well-publicised success with these boxes, and the revised policing methods they allowed, soon led to the adoption of similar police box systems in many of the larger cities in the north of England, including Manchester and Sheffield. The Metropolitan Police (Met) introduced police boxes throughout London between 1928 and 1937, and the design that later became the most well-known was created by the Met's own surveyor and architect, Gilbert MacKenzie Trench, in 1929. Initially, two competing prototype designs were installed on the newly built Becontree Estate in December 1928, with the winning builder being contracted to erect 43 boxes made of wood with concrete roofs in the final Trench pattern as part of experimental installations in the Richmond and Wood Green sub-divisions, which were completed in December 1929 and January 1930 respectively. Their success resulted in the widespread adoption of the system throughout Greater London over the next eight years using newer models of the Mackenzie Trench design now made completely of concrete for increased durability, save the doors, which were still made of teak. Constables complained that the concrete boxes were extremely cold and damp compared to their wooden predecessors, so provisions were made for more powerful heaters. For use by officers, the interiors of the boxes normally contained a stool, a table with drawer, a brush and duster, a fire extinguisher, a first aid kit, and a small electric heater. Like the 19th and early 20th century Glaswegian boxes, the London police boxes had a light at the top of each box, which would flash as a signal to police officers indicating that they should contact the station. By 1953, there were 685 police boxes on the streets of Greater London, with an additional 72 smaller police posts, also designed by Trench, used in the inner divisions where there was no space for the larger kiosks. Between 1923 and 1960 the police box and/or post system had been adopted by most of the provincial police forces throughout Great Britain. The design and construction of the police boxes used in each system were at the discretion of each individual force, and consequently varied a great deal from location to location, but the police pillars/posts were usually one of three successive models provided by the General Post Office (GPO). Police boxes continued to play an important role in police work until the late 1960s to early 1970s, when they were phased out following the introduction of personal radios. As the main functions of the boxes were superseded by the rise of portable telecommunications devices like the walkie-talkie and the near universal access by the public to telephones and the 999 emergency number, very few police boxes remain in Britain today. Some have been converted into High Street coffee bars. These are common in Edinburgh, though the city also has dozens that remain untouched — most in various states of disrepair. Edinburgh's boxes are relatively large, and are of a rectangular plan, with a design by Ebenezer James MacRae, who was inspired by the city's abundance of neoclassical architecture. At their peak there were 86 scattered around the city. In 2012, Lothian and Borders Police sold a further 22, leaving them owning 20. Beginning in 1933, a slightly simplified version of the Met's police box design was also used by the City of Glasgow Police when its old cast-iron police boxes were replaced by an expanded Crawley type of integrated police box system. This was done as part of the restructuring of the force brought about by Percy Sillitoe after he was appointed Chief Constable at the end of 1931. Like the cast-iron boxes before them, the new concrete boxes continued to be painted red until the popularity of Doctor Who prompted a change to blue in the late 1960s. In 1994, Strathclyde Police decided to scrap the remaining Glasgow police boxes. However, owing to the intervention of the Civil Defence & Emergency Service Preservation Trust and the Glasgow Building Preservation Trust, some police boxes were retained and remain today as part of Glasgow's architectural heritage. At least four remain—on Great Western Road (at the corner of Byres Road); Buchanan Street (at the corner of Royal Bank Place); Wilson Street (at the intersection of Glassford Street, completely restored); and one near the corner of Cathedral Square (at the corner of Castle Street, also restored). There was also a red police box preserved in the Glasgow Museum of Transport but this was returned to the Civil Defence Trust after Glasgow City Council decided it did not fit in with the new Transport Museum. The police boxes in Glasgow on Great Western Road, Cathedral Square, and Buchanan Street are currently under licence to a Glasgow-based coffee outlet. As of 2009[update], only the Great Western Road and Buchanan Street boxes have been transformed to dispense beverages, and restrictions are enforced by the Civil Defence & Emergency Service Preservation Trust to prevent the exterior of the boxes from being modified beyond the trademarked design. The Civil Defence & Emergency Service Preservation Trust now manages 11 of the UK's last Gilbert Mackenzie Trench police boxes on behalf of a private collector. Another blue police box of this style is preserved at the National Tramway Museum, Crich, Derbyshire. One of the trust's boxes stands outside the Kent Police Museum in Chatham, Kent. and another at Grampian Transport Museum. An original MacKenzie Trench box exists in the grounds of the Metropolitan Police College (Peel Centre) at Hendon. There is no public access, but it can easily be seen from a Northern line tube train travelling from Colindale to Hendon Central (on the left hand side). In the City of London, there are eight non-functioning police "call posts" still in place which are Grade II listed buildings. The City of London Police versions were cast iron rectangular posts, as the streets are too narrow for full sized boxes. One compartment contained the telephone and another locked compartment held a first aid kit. Fifty posts were installed in the "Square Mile" from 1907; they were in use until 1988. On Thursday 18 April 1996, a new police box based on the Mackenzie Trench design was unveiled outside the Earl's Court tube station in London, equipped with CCTV cameras and a telephone to contact police. The telephone ceased to function in April 2000 when London's telephone numbers were changed, but the box remained, despite the fact that funding for its upkeep and maintenance had long since been exhausted. In March 2005, the Metropolitan Police resumed funding the refurbishment and maintenance of the box. Glasgow introduced a new design of police boxes in 2005. The new boxes are not booths but rather computerized kiosks that connect the caller to a police CCTV control room operator. They stand 10 feet in height with a chrome finish and act as 24-hour information points, with three screens providing information on crime prevention, police force recruitment and tourist information. Manchester also has Help Points similar to those in Glasgow, which contain a siren that is activated upon the emergency button being pressed; this also causes CCTV cameras nearby to focus on the Help Point. Liverpool has structures similar to police boxes, known as police Help Points, which are essentially an intercom box with a push button mounted below a CCTV camera on a post with a direct line to the police. Boscombe in Bournemouth opened its own old-style police box in April 2014 in a bid to tackle crime in the area. The box contains a yellow phone for when it is not staffed by police, along with security cameras and a defibrillator. The TARDIS prop used from 2010–17 seen at BBC Television Centre. The BBC science-fiction television series Doctor Who features a time machine, the TARDIS, disguised as a Mackenzie Trench-style police box; normally capable of disguising it to blend into its surroundings, the ship's "chameleon circuit" broke down in England in 1963, and left the TARDIS seen most often in the show stuck as a police box, except for a brief period in one adventure seen in 1985. Doctor Who was originally transmitted from 1963 to 1989; as police boxes were phased out in the 1970s, over time the image of the blue police box became associated as much with Doctor Who as with the police. In 1996, the BBC applied for a trademark to use the blue police box design in merchandising associated with Doctor Who. 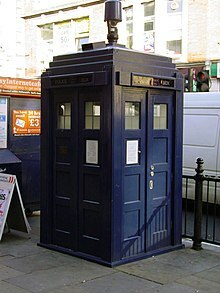 In 1998, the Metropolitan Police filed an objection to the trademark claim, maintaining that they owned the rights to the police box image. In 2002, the Patent Office ruled in favour of the BBC, arguing out that there was no evidence that the Metropolitan Police—or any other police force—had ever registered the image as a trademark. In addition, the BBC had been selling merchandise based on the image for over three decades without complaint by the police. The series was revived in 2005, and the police box continues to feature prominently in almost every episode. Although the dimensions and colour of the TARDIS used in the series have changed many times, none of the BBC props has been a faithful replica of the original MacKenzie Trench model. This has been explained within the context of the show that chameleon circuits tend to display a bit of "drift" if left in the same setting for too long, and in any case the circuit of the Doctor's TARDIS is malfunctioning. This was acknowledged in the episode Twice Upon a Time which had the Twelfth Doctor meet the First Doctor, and had the original incarnation and Bill Potts point out the visible differences between the modern and original TARDISes. This police box in Edinburgh now serves as a coffee shop. This police box in Edinburgh now serves as an art gallery. An Edinburgh police box with graffiti from the 2014 Scottish independence referendum. A police box on the seafront at Scarborough. An old police box (no telephone) in Covent Garden, London. A City of London Police post on Eastcheap, 1981. A modern police box in Baltimore, Maryland, based on the British concept. Fire alarm and police call box in San Francisco, one of 2,040 and 460 in the city. Police telephone post (not functional) at St. Martin's Le Grand, London — painted (incorrectly) in 'Met' dark blue. 'City' boxes were painted in a light blue. A 1929 Mackenzie Trench design police box preserved at the National Tramway Museum in Crich, Derbyshire. A Glasgow police box near the Glasgow Royal Concert Hall serving as a hemp dispensary. ^ a b c d e f g h i j Stewart, The Police Signal Box: A 100 Year History . ^ a b "BBC wins police Tardis case". BBC News. 2002-10-23. Retrieved 2007-01-17. ^ "History of the Chicago Police", John Joseph Flinn & John Elbert Wilkie (1887). ^ "Decentralization and the Police Box System", by Frederick James Crawley; Police Journal, Vol. 1 (1928). ^ a b c d "Police Boxes". History of the Metropolitan Police Services. UK: Metropolitan Police. Retrieved 2007-01-17. ^ Burton, Immanuel. "History". Police Boxes. UK. Archived from the original on 2010-03-04. Retrieved 2007-01-17. ^ "A History of the Real Police Box". The Mind Robber. Retrieved 2010-02-17. ^ a b McPherson, Ian (2004). "The Police Box Page". Kiosk Korner. Archived from the original on 2007-01-22. Retrieved 2007-01-23. ^ "Police box sale could give blues to buyers". Retrieved 2013-03-09. ^ a b "The Police Boxes". Civil Defence & Emergency Service Preservation Trust website. Archived from the original on 2001-04-30. Retrieved 2007-01-23. ^ Stuff, Good. "Listed Buildings in England". www.britishlistedbuildings.co.uk. ^ "Law & Order route". www.london-footprints.co.uk. ^ "The Earl's Court Police Box, London, UK". BBC h2g2. 2006-11-23. Retrieved 2013-08-14. ^ "Police box offering hi-tech help". BBC News. 2005-08-24. Retrieved 2007-01-17. ^ Frampton, Will (2014-04-18). "Police box Tardis pulls the crowds at Boscombe". Bournemouth Daily Echo. Retrieved 2017-04-22. ^ "Case details for Trade Mark 2104259". UK Patent Office. Retrieved 2007-01-17. ^ a b Knight, Mike. "IN THE MATTER OF Application No. 2104259 by The British Broadcasting Corporation to register a series of three marks in Classes 9, 16, 25 and 41 AND IN THE MATTER OF Opposition thereto under No. 48452 by The Metropolitan Police Authority" (PDF). UK Patent Office. Retrieved 2007-01-17. ^ Winter, Paul (2002-10-24). "Time and Registered Documentation in Space". Doctor Who Appreciation Society. Archived from the original on 2004-10-21. Retrieved 2007-01-17. ^ "Doctor Who A History of the TARDIS Police Box Prop and its Modifications". Retrieved 2010-02-17. ^ "Why S.F. still counts on street fire alarm boxes". Stewart, Robert W. (June 1994). "The Police Signal Box: A 100 Year History" (PDF). University of Strathclyde. Archived from the original (PDF) on 13 March 2005. Wikimedia Commons has media related to Police boxes. "Police box", History, Metropolitan Police . The TARDIS Library — a guide to the various police box props used in Doctor Who over the years, and their relationship to real police boxes. McPherson, Ian, "The Police Box page", Kiosk Korner, archived from the original on 2007-01-22 . "The Great Edinburgh TARDIS Quest", Flickr, Yahoo! — set devoted to tracking down remaining Edinburgh police boxes. Steven, Michael ‘Mike’, "Police Box Typology", Carbon Made — fine art policebox photographic typology. Police Boxes — catalogue of police box models. This page was last edited on 9 April 2019, at 16:59 (UTC).